AspDotNetStorefront is an eCommerce platform that can help businesses with their online sales and marketing. With its versatile and configurable retail features, AspDotNetStorefront is able to meet the needs of most businesses. AspDotNetStorefront was founded in 1997 and it started as a software service for businesses in United States. With continuous evolution and innovation, it has now become a preferred software service in many parts of the world. On its customer list, there are prominent companies from all sizes and industries looking to improve deal closure on the web. Whether you have a store to manage or if you want to advertise your product through digital marketing, AspDotNetStorefront takes care of it all. It can work for single and multiple stores and lets you manage everything from a single interface. AspDotNetStorefront is highly customizable. This allows you to equip your user interface with the most needed elements. It works well because it gives you a much clearer idea of how the operations are running on daily basis. Also, the all in one interface keeps you updated with what might be happening in your other stores if you have multiple stores. The multichannel connectivity lets you market your products and integrate catalogs over the web. Also there is an email marketing tool available in the package. These tools are particularly helpful in improving your online presence so that customers can access your website through their smart phones and other mobile devices. You can manage accounts for your customers and gift them loyalty points. In this way, you can make more prospective customers for a longer time duration. Managing orders can be complicated especially when you have multiple stores. AspDotNetStorefront can manage shopping carts and in case your customers have to return any products, there is a management solution available for that too. When it comes to analyzing your company’s own performance, AspDotNetStorefront also provides features to track employee growth rates and how your employees are distributed department-wise. You can monitor hiring trends and several other parameters which can help you with decision making about many complex organizational problems. AspDotNetStorefront also provides content management services. SEO management tool is a critical part of online marketing these days so this software tool becomes a complete package to boost your business websites and blogs. If you are interested in AspDotNetStorefront it could also be beneficial to investigate other subcategories of Best eCommerce Software gathered in our database of SaaS software reviews. There are popular and widely used solutions in each software category. But are they necessarily the best fit for your enterprise’s specific needs? A trendy software application may have thousands of subscribers, but does it provide what you require? For this reason, do not blindly shell out for popular systems. 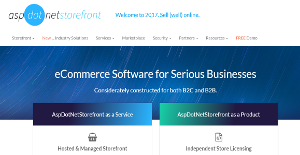 Read at least a few AspDotNetStorefront reviews and consider the elements that you want in the software such as the cost, main features, available integrations etc. Then, choose a few solutions that fit your needs. Check out the free trials of these platforms, read online reviews, get information from the vendor, and do your research thoroughly. This profound research is certain to help you choose the best software application for your organization’s special requirements. How Much Does AspDotNetStorefront Cost? We realize that when you make a decision to buy eCommerce Software it’s important not only to see how experts evaluate it in their reviews, but also to find out if the real people and companies that buy it are actually satisfied with the product. That’s why we’ve created our behavior-based Customer Satisfaction Algorithm™ that gathers customer reviews, comments and AspDotNetStorefront reviews across a wide range of social media sites. The data is then presented in an easy to digest form showing how many people had positive and negative experience with AspDotNetStorefront. With that information at hand you should be equipped to make an informed buying decision that you won’t regret. What are AspDotNetStorefront pricing details? What integrations are available for AspDotNetStorefront? If you need more information about AspDotNetStorefront or you simply have a question let us know what you need and we’ll forward your request directly to the vendor.